Apples are well-known for their great nutritional value, but their cultural history and vast medicinal use are often forgotten. Read on to learn all about apples' hidden health benefits and how to best utilize them in day-to-day life. Everyone's heard the saying, "An apple a day keeps the doctor away," but not many know why it continues gaining popularity throughout the years. Dating back as far as 6500 BCE, apples have continued to provide consumers worldwide a myriad of nutritional and medicinal benefits. From consuming them raw to using it in their oil form, there are a variety of ways in which to enjoy apples. Improving intestinal motility. 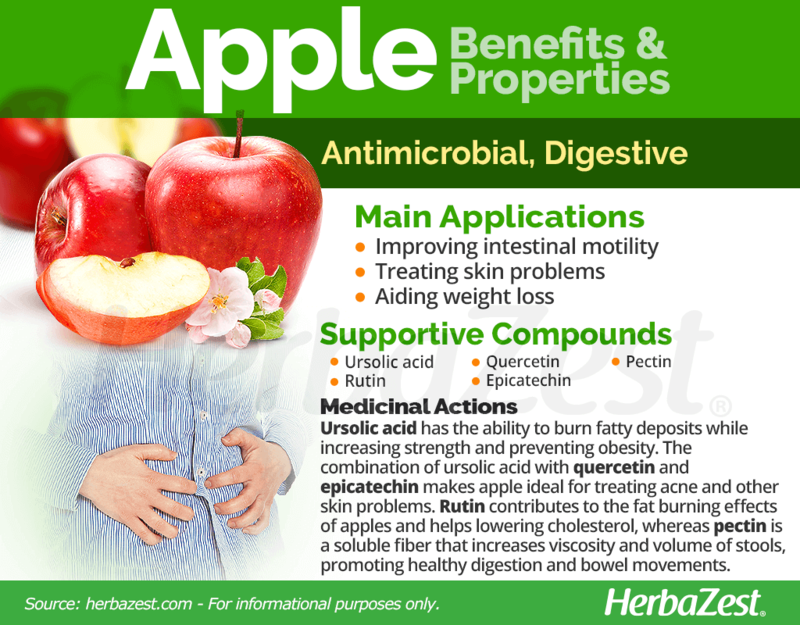 Apple's high fiber content helps normalize bowel movements, improving intestinal functions. Treating skin problems. Apple seed oil has traditionally been used for treating skin lesions and acne. Aiding weight loss. Apples are made up mostly of water, so they have a low caloric value, which makes them a smart option for weight control. As for nutritional value, apples contain dietary fiber, vitamins C, B2 (riboflavin), magnesium, and potassium, as well as both simple and complex sugars. Apple peels contains ursolic acid, which has been found to possess astringent, anti-parasitic, and antiseptic properties. 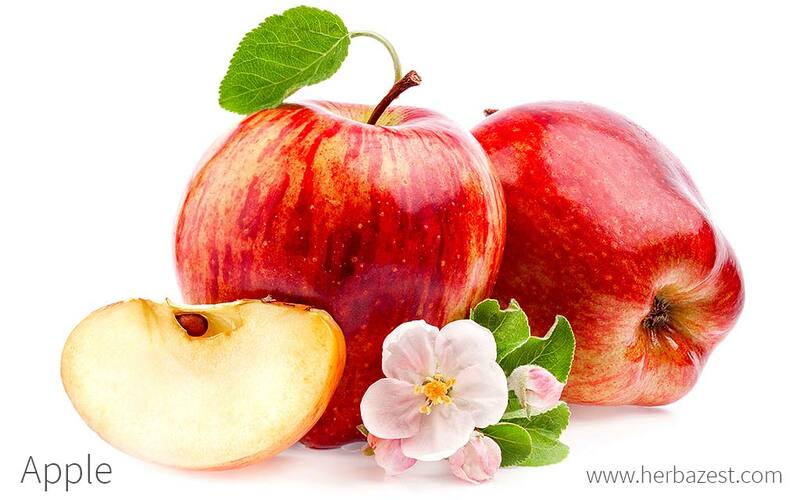 The combination of ursolic acid with the antioxidant, antimicrobial actions of quercetin and epicatechin makes of apple a great ally against skin lesions and acne. Emerging research is linking ursolic acid to the ability to turn white adipose tissue - the normal fatty deposits carried under the skin - into brown adipose tissue, a special type of fat that is burned by the body to generate heat. This brown fat also shares origins with skeletal muscle. Increased consumption in ursolic acid leads to increased strength and endurance, ultimately helping prevent obesity. Basil and meadowsweet also possess antibacterial properties, and similar digestive benefits can be found in herbs like papaya and spinach. While apples are healthy fruits, people with birch-pollen allergies can develop an allergy to apples because of similarity in proteins. This syndrome - referred to as birch-apple syndrome- usually occurs up to 15 minutes after consumption of a raw apple and includes oral reactions, such as an itchy throat and inflammation. The amount of allergen in the raw fruit depends on the variety, maturity, and storage conditions. Seed medical attention immediately is there is suspicion of an allergic reaction while eating raw apples or taking apple cider vinegar. Consuming apple juice can interfere with the effectiveness of some prescription drugs, such as antihistamines and cardiovascular medications. This is due to substances in apple juice blocking the action of transporters that help move a drug into cells for absorption. Read medication labels for specific instructions on what to avoid. And if still uncertain, consult a trusted health physician about fruit juice consumption with medications. The nutritional value of apple is based in its high amounts of water and dietary fiber, which provide hydration and a long feeling of satiety, two great apple benefits for skin health and weight loss, as well as for the digestive system. 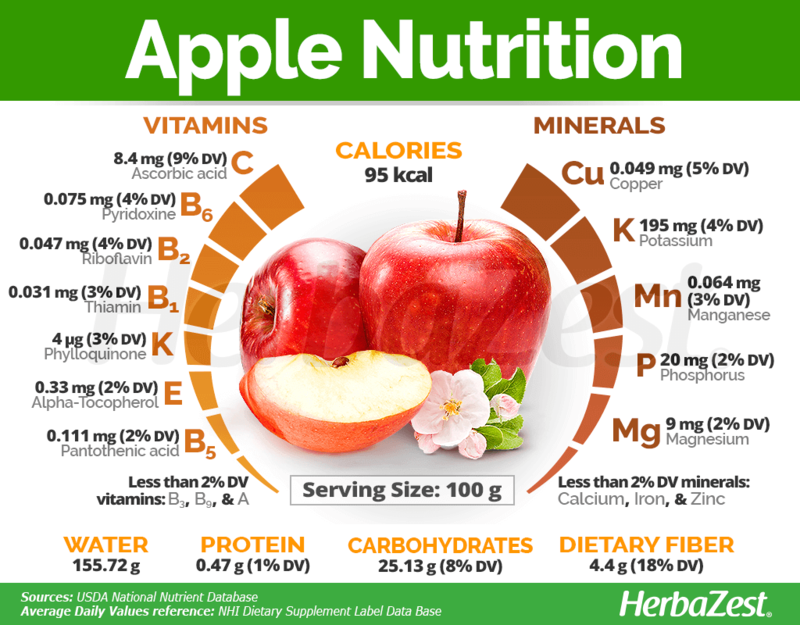 Apple's nutrition is rounded by fair amounts of vitamin C (ascorbic acid) and copper, as well as by small quantities of important minerals, such as potassium, manganese, magnesium, phosphorus, calcium, iron, and zinc, along with vitamins, including most of the B complex, choline, vitamin A (as carotenoids), vitamin E (alpha-tocopherol), and vitamin K (phylloquinone). One medium-sized apple (182 g) provides 95 calories, 156 grams of water, and 18% of the daily value for dietary fiber. Equal parts sweet, tart, and crunchy, apple is an extremely popular food source around the world and, for many, steadily fulfills part of the daily fruit requirement. Including more apple into a regular and balanced diet is highly recommended for flavor and nutrition. However, for medicinal purposes, apple can be prepared in concentrated forms for a variety of preparations. Raw. 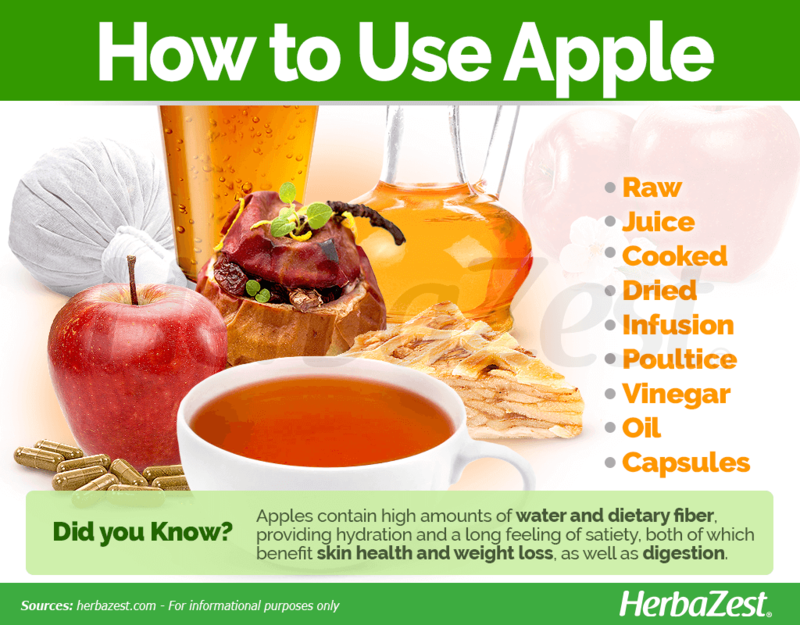 Eat an apple raw to reap the most benefits from its fiber, vitamins and minerals. Cooked. Apples are also used as an ingredient in larger dishes, from sandwiches to dinner entrees to various baked goods. Infusion. An infusion made from apple bark or leaves is thought to help settle upset stomachs, heartburn, and reflux due to its astringent nature. It is also believed to help calm diarrhea or address chronic loose stool. Swishing the infusion around in the mouth may help tone weak and easily bleeding gums. Poultice. Apple leaves are believed to help with inflamed swellings, boils, bug bites, and scratches as a chewed, topical application. Capsules. Apple cider vinegar pills boast the same benefits as consuming apples by helping improve digestion to promote weight loss. Pectin supplements are also used for diabetes and reflux. Beverages. In beverages, alcoholic and non-alcoholic ciders have been popular for centuries, and apple and cinnamon are often paired as flavorful infusions. In most temperate locations, apples can be found year-round in grocery stores and supermarkets. The freshest produce, however, can be found during fall harvest months in similar locations, as well as in farmers' markets. Many orchards will also let customers pick their own apples for fun and sell many homemade apple products made on-site. In the selection of fruits, the skin should not give when gently squeezed by hand. Pectin, the soluble fiber found in apple, is the most readily available kind of all the fruit's supplements, coming chiefly in capsule form. Pectin capsules are generally available in most places that a wide range of herbal remedies are sold, and online outlets offer the most selection of concentrations and prices. Apple cider vinegar and apple seed oil are also considered health supplements, and they can be found in specialized health food stores and some supermarkets. Apples are deciduous trees that have adapted to temperate climates with relative seasonal change. Growing this fruit in a backyard orchard is a useful addition for any home gardener. Apple trees are usually propagated by grafting. However, apple seeds can be planted in the autumn for late winter germination. Apple trees grow best in deep, well-drained, loamy soil with pH of 6 - 7, in a sunny location. Approximately 1,000 hours of winter temperatures below 44°F (7°C) incite flower development later on. The trees require adequate rainfall - 23 - 31 inches (600 - 800 mm) annually - to ensure future fruiting as well. Seeds may take 12 months or more to sprout and several subsequent years to produce fruit. For home growing, it is generally recommended to buy young apple trees from a local nursery. Apples must be unhooked, not pulled, from the attachment point when harvested. Bruising from improper picking methods with reduce quality grade and increase storage losses. Control pest problems before they become worse by cutting dead or diseased branches, removing dried apples, and clearing leaves and fallen debris away from the trees. More detailed information about growing apples can be found in the herb garden section. The apple tree stands approximately 30 feet (9 m) tall and has a spreading canopy of elliptical leaves during warmer months. Its flowers, which bloom in the spring, are white with red-pink undersides and give way to a fruit classified as a pome, where the fleshy bulk actually derives from the flower cup. Each fruit contains approximately five small seeds. The apple tree (Malus domestica) is one of over 2,800 species belonging to the Rosaceae family, which notably includes apricot (Prunus armeniaca), cherry (Prunus spp. ), pear (Pyrus communis), agrimony (Agrimonia eupatoria), and blackberry (Rubus fruticosus). Apple is one of the up to 55 species of Malus that grow in the Northern Hemisphere, though it alone is the most commonly consumed. A hybrid species, the domestic apple is itself a subspecies of several others. It is thought that two of the major contributing parent species were Malus sieversii, a central Asian strain, and the wild European crabapple, Malus sylvestris. M. domestica comes in over 7,500 different varieties today. Some of the most popular commercial types include 'Red Delicious' and 'Fuji' apples, which are particularly sweet; 'Granny Smith' apples, which are tarter; and 'McIntosh' apples, considered best for baking, among other varieties. The first edible apple varieties are believed to be native to eastern Jordan and date back as far as 6500 BCE, but the exact origins of the fruit as we know it today are less clear. It is thought that the genus Malus, meaning "evil" after the biblical story of Genesis, is a hybrid of many different wild species ranging from Asia to Western Europe, actively cultivated throughout temperate climates on the Eurasian continent since at least 323 BCE. Apples eventually became a staple food across the Mediterranean region and were incorporated into religious lore by the ancient Greeks, Romans, and Hebrews. It remained one of the quintessential symbols of the autumn harvest throughout the Middle Ages. British settlers first brought the tree to North America in the 1600s, where it became so popular as to develop into a cultural symbol for the United States. Apples are the second most consumed fruit, and global production was estimated at over 67 million metric tons in 2012 alone. China generates the vast majority of production, contributing with 38 million metric tons, with the U.S. as a second largest producer. Apple cultivation is also a major economic activity in the European Union, Turkey, and Chile. Apples are also one of the most valuable fruit crops in the United States; every state grows them with Washington leading production at 70%. Other leading states include New York, California, Virginia, and Pennsylvania. Food industry. 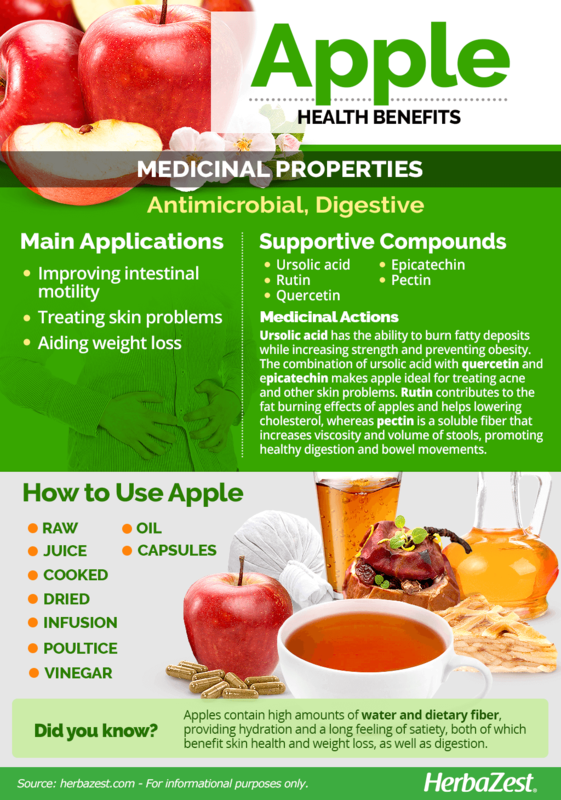 Many industries have used apple to their advantage over the years, particularly for its high concentration of pectin, which can be used as a thickening agent in isolation. Preservatives used in jams and jellies are known to include the substance. Timber. Apple tree wood has been employed in the past as fuel and construction material for canes and furniture. Personal care. Apple extracts are used for their astringent and antioxidant benefits to rejuvenate the skin and help with anti-aging efforts on different skin types. It can be found in oils, extracts, salves, and creams. Alcohol industry. Apples are used in the making of many traditional liquors, like calvados and apple sour, as well as in apple wine and hard cider. Apples are recognized worldwide for their delicious, varying tastes and textures, as well as for their many uses outside of the kitchen. However, their medicinal benefits for improving skin tone and controlling weight, among others, are adding value to their increasing popularity as one of the healthiest fruits.